For optimum surface finish and contour duplication on your flat test specimens , you need carbide cutting tools engineered specifically for high speed machining with Tensilkut. Super cutting edge sharpness combined with other angles of cut and relief are essential to achieve the fine shavings required for non deformed specimen edges. We stock a wide variety of Tensilbits for many applications, including various metals, plastics, ceramics, fiberglass, and Kevlar. Tensilbits are matched to the Tensilkut machine with which they will be used. 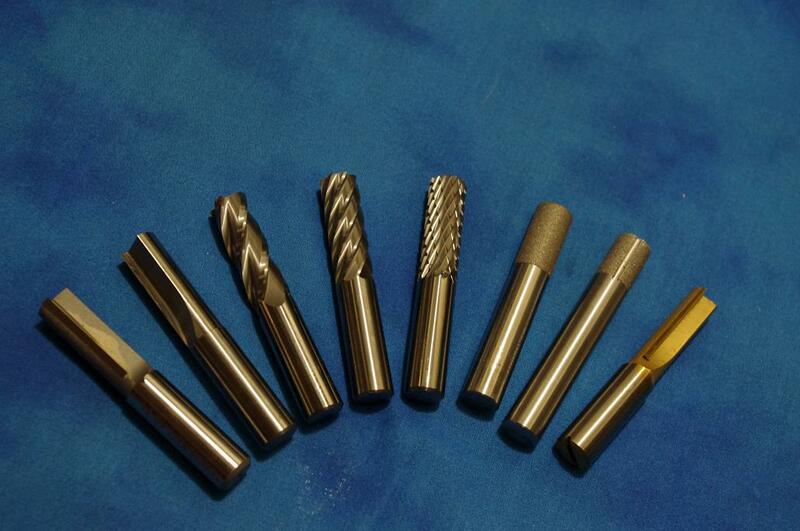 The picture below shows the 40-70 series half inch diameter Tensilbits, including the 40-71 TiN coated Tensilbit. This entry was posted on July 23, 2014 at 8:19 pm and is filed under Tensilbits. You can follow any responses to this entry through the RSS 2.0 feed. You can leave a response, or trackback from your own site.